Charles Strong was born on September 26, 1844 at Dailly, Ayrshire (Scotland). His early education was at the village school and then at Academies in Ayr and Glasgow. He commenced studying at Glasgow University when he was fifteen years old. The method of instruction differed from that in English universities. Professors engaged in dialogue with their students and there was less emphasis on rote learning. Strong's democratic outlook, his extensive knowledge, his pleasure in the interconnection of ideas and sense of logic are attributed, in part, to his studies at the university. He completed his MA course in 1862-3. Then he entered the Divinity course which he completed in 1866-7. In 1868 he was ordained. Four years later he married Janet Julia Fullarton Denniston. She was a well-educated woman who shared his interests and supported him throughout his ministry. Strong was minister of the Scots Church in Melbourne from 1875 to 1883 and of the Australian Church from 1885 until his death on 12 February 1942. The congregation of the Scots Church in Melbourne flourished under Strong's leadership. Among the many people he attracted to church services were non-Presbyterians and people who were previously not interested in religion. He set up several groups for discussion of literary, religious and social topics. He was highly regarded by community and church leaders, as well as by working class people who respected his sincerity and concern for social justice. He taught his congregation that there was little value in religion without service to the neighbor in need and was at the forefront of efforts to draw attention to problems in the slum areas of Melbourne. He was an active member of the Australian Health Society which promoted guidelines for good health, was president of the Convalescents Aid Society and secretary of the Society for the Promotion of Morality. He was also involved with efforts to improve housing in slums and in giving support to unmarried mothers. Although he was known to be a liberal in theological and social matters, this did not arouse any conflict until 1877. In that year an anonymous pamphlet appeared in which concern was expressed about the preaching of false doctrines, the mocking of orthodoxy and the denial of the supernatural elements in Christianity. Although Strong was the target of these accusations, he was not named in the pamphlet. However, from that time he was under suspicion of heresy. His article on the Atonement, a scholarly description of the development of this doctrine, was published in 1880. It raised concerns about his radical views which some regarded as heretical. Strong resigned in August 1881 but was persuaded to take six months leave and then to serve the congregation for a further twelve months. It appears that he was driven out of the Presbyterian Church by a small group of his colleagues. The main complaint against him was that he failed to emphasize sufficiently certain points of doctrine which his accusers considered to be essential. Although there was no examination of the charges brought against him, he was officially declared not to be a minister of the Presbyterian Church in November 1883. He then left for a visit to Scotland. Strong's "social views" and attempts at reforming society were intrinsic to his religious perspective. He rejected the idea that religion was not concerned with matters of everyday life, with social welfare or with economics. He regarded with disdain the idea that religion was mainly concerned with the preparation for life after death, with salvation and damnation, preaching and praying, services and sacraments, the Bible, and vestments. He believed that the first task of the church was to preach "freedom, justice, peace, charity, compassion and reconciliation". It should condemn everything that was contrary to the Gospel. The mission of the church was not to attract more people but to change the world. For him social issues were also spiritual issues. Religion was interconnected with consideration of social problems and action to bring about solutions. Upon his return to Victoria in October 1884, Strong was approached by a group of friends and supporters who asked him to preach for them during the next twelve months in a hall which they would hire. In November 1885 a new church was constituted and Strong was asked to be its first minister. Although involved in the formulation of its aims and objectives, Strong made it clear that he was not the founder of the "Australian Church". In a review after the first year, it was noted that attendance at services had been about a thousand each Sunday and large sums of money had been donated for a church building. The principles and basic ideas of the church were published for the information of the public. The Australian Church aimed to be " a comprehensive Church, whose bond of union is the spiritual and the practical rather than creeds or ecclesiastical forms". The imposition of theologies and interpretation of the Gospel from the past was seen to hinder both minister and congregation. Membership of the church required "sympathy with the general spirit and aims of the society, the honest effort to carry into modern life and thought the religion of Reason and Love and contribution to the funds of the society according to ability". The notion of a church that was non-dogmatic, inclusive and tolerant was not new. It was one of the important ideas of the liberal religious movement of nineteenth century Scotland and England. Strong organized the social work of this new Church. It included aid for children, a creche for the children of working mothers (led by Mrs Strong) and a Working Men's Club. He set up societies for the discussion of literature and music, and the Religious Science Club. He also maintained a strong interest in the value and significance of religions other than Christianity. The establishment of the Australian Church did not result in a movement of secession from traditional churches. Australian Churches were set up in Newcastle, Lucknow and Sydney but they did not last long. By 1905 the Australian Church in Melbourne was the only one. The depression in the 1890s and the departure of some of the wealthy members of the congregation meant that financial support for the Church was reduced. Attendance at services was still about one thousand. The societies formed to discuss economic, literary, social and religious problems attracted people who were not associated with the congregation. The major problem was the debt on the church building . This appeared to be solved when a group of four men bought the building and leased it back to the congregation. However, lack of funds continued to be a problem and attendance at services gradually declined. Eventually, the departure of numerous families from the city meant that there was no longer a reliable source of income for the church. 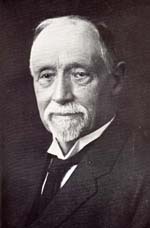 Strong resigned from the congregation on October 6, 1913 thereby leaving its members and its management committee free to make decisions about the future of the church. When all seemed lost, the bequest of a large sum of money enabled the church to continue to pay the minister and in due course to purchase a smaller building. Strong's interest in world peace and his views on peaceful means of settling international problems made him unpopular during 1914-1918 and resulted in the resignation of many members of his congregation. His opposition to war and to a proposal by the Australian Government in 1917 to conscript Australians for service in overseas countries aroused the disapproval of friends and supporters. The press in Melbourne also attacked him for the first time in his career. A renovated church was purchased in 1922. However, the congregation did not flourish. Old members died and Strong's calls to "social duty and responsibility" did not appeal to young people who thought that the church did not show enough interest in present-day matters. This was in spite of the fact that Strong and his congregation were very much involved in addressing the needs of society. They were active in their support for peace, quick to support a campaign to assist victims of the Spanish Civil War and among the first to help Jewish refugees from Germany and Eastern Europe. Members of the congregation were made aware of the need for justice for Australian Aboriginal people. They were active in promoting reform in prisons and abolition of capital punishment. Strong was at the forefront of moves to provide for mentally handicapped children. The depression of 1930-1933 was a very difficult time. Numbers declined and so did the financial support. This state of affairs continued during the years that followed. After Strong's death, Rev Mervyn Plumb accepted the call to become minister of the church in January 1943 and remained in that position until October 1950. On July 10, 1955 the final service of the Australian Church took place. It was decided that the establishment of a trust would be an appropriate memorial to Strong. The church building and the organ were sold and after payment of debts, the remaining money was paid to the Charles Strong (Australian Church) Memorial Trust. On February 3, 1957 the Australian Church was dissolved. It was the enduring interest of Strong in non-Christian religions as worthy of respect and serious study that led to the decision to make the primary object of the Trust ‘the sympathetic study of religions other than Christianity’. Charles Strong was born in 1844 in Scotland, began university at 15, was ordained in 1868 and became a minister of Scots Presbyterian in Melbourne in 1875. Due to an anonymous pamphlet suspecting him of heresy relating to the doctrine of atonement, he was removed from his church in 1883 and returned to Scotland. Upon his return to Victoria in October 1884, Strong was approached by a group of friends and supporters who asked him to preach for them during the next twelve months in a hall which they would hire. In November 1885 a new church was constituted and Strong was asked to be its first minister. Although involved in the formulation of its aims and objectives, Strong made it clear that he was not the founder of the "Australian Church�. Strong had a disdain for religion that focussed on preparation for life after death, salvation and damnation, services and sacraments, the Bible and vestments. The task of the church, he claimed, is to preach �freedom, justice, peace, compassion and reconciliation�. Membership of the church required "sympathy with the general spirit and aims of the society, the honest effort to carry into modern life and thought the religion of Reason and Love and contribution to the funds of the society according to ability" (Badger, 1971, 104). The notion of a church that was non-dogmatic, inclusive and tolerant was, however, not new. It was one of the important ideas of the liberal religious movement of nineteenth century Scotland and England. Following the Spirit not the letter�Jesus did not ask the woman who anointed his feet whether she believed in a creed, but if she had faith in him. Knowing the Spirit�as the �universal all-animating Spirit�, an eternal and deep dimension of reality. The Trinity is re-interpreted in terms of this deep Spirit in the universe. Reading via the Spirit�with a clear mind that is part of the eternal Mind led by the universal Spirit/Word to follow the Gospel of trust in God as Light and Love. Reading Nature�imbedded within deep mysteries of life. Understanding the Gospel�as the message that God is Spirit, that God is love and that God so loved the world as to send his Son to draw us into sonship and make us partakers in a divine life. Strong also speaks of a �spiritual Christianity�, a movement that links us with the spirit deep in all things and the spirit deep in each human. Spiritual Christianity ought to be an expression of who we are, expressing the spirit/divine within. When we discern the Spirit of Christ in the text, rather than search for doctrine or theology, we facilitate this process. According to Strong, Christianity must be reborn. It must change with the times, knowledge and the evolution of humanity in society. Christianity must reflect the kingdom/spirit of God within each of us and ultimately be connected with the cosmic spirit. Christianity must shed the book and letter worship of the past and adopt a new cosmology � no more heaven and hell! And finally, Christianity must be part of the moral force for social change. Social justice was central to Strong�s re-interpreting of Christianity. He saw this dimension associated with both evolution and Scripture. He believed there has been and continues to be an evolution of human knowledge. Christians need to take this reality into account when reading the Bible, re-reading theology, re-interpreting Christianity and living social justice. Spiritual Christianity has a crucial moral and social dimension. God is not the God of the individual only or of the physical universe, but also the God of the Social Order. God�s nature cannot be interpreted apart from the laws of that Order manifested in social nature. The fundamental principle of social justice is: Live by the law of Love! Strong organized the social work of the Australian Church. It included aid for children, a creche for the children of working mothers (led by Mrs Strong) and a Working Men's Club. He set up societies for the discussion of literature and music, and the Religious Science Club. He strongly supported women�s right to vote and was heavily involved in prison reform. He also maintained a strong interest in the value and significance of religions other than Christianity. Strong was vehemently opposed to any wars. �I cannot reconcile war and democracy, war and the Christianity of Christ�. He preached fiercely against the Boer War, declaring it to be rampant militarism and morally wrong. As a result, many of his followers no longer attended his church. Strong's interest in world peace and his views on peaceful means of settling international problems made him unpopular during the 1914-1918 War and resulted in the resignation of many members of his congregation. His opposition to war and to a proposal by the Australian Government in 1917 to conscript Australians for service in overseas countries aroused the disapproval of friends and supporters. The press in Melbourne also attacked him for the first time in his career. a willingness to suffer until this great �law of our being� is realised in society. Strong rarely functioned as a modern preacher, taking a particular text and doing a detailed exegesis as the basis for his sermons. Rather he functioned with a progressive theology which may be summarised as spiritual, evolutionary and moral. Yet, these three are all expressions of a divine unity. There is an underlying interconnectedness of the physical, the spiritual and the ethical. And that unity is not in some distant realm, but within each of us. Nor is it a distant concept; rather it is an energising force�that divine Love with moves all things to live, to love and to realise the Kingdom of God in creation. Our task is to discern that Love in the text and be agents of that Love in society. Christianity Re-interpreted and Other Sermons. Melbourne: George Robertson and Company.